For two hundred years the different monarchies of the Royal Vispasian Union have thrived and prospered under the watchful eyes of the independent law enforcers of the Sun Chamber. But corruption, thievery and death are still very much part of the world’s make-up and the stench of deceit greets Chamber Officer Lucan Drakenfeld when is called back home to Tyrum to attend his father’s funeral. Once there, Drakenfeld is unexpectedly entangled in two separate investigations: one sparked by his troubled findings into the circumstances surrounding his father’s sudden death and the other when Lacanta, the King’s sister, is brutally murdered inside a locked chamber. The former will lead Lucan down a path of disturbing familial discoveries and the latter will not only puts his investigative skills in question but also might jeopardise the very fate of Tyrum. 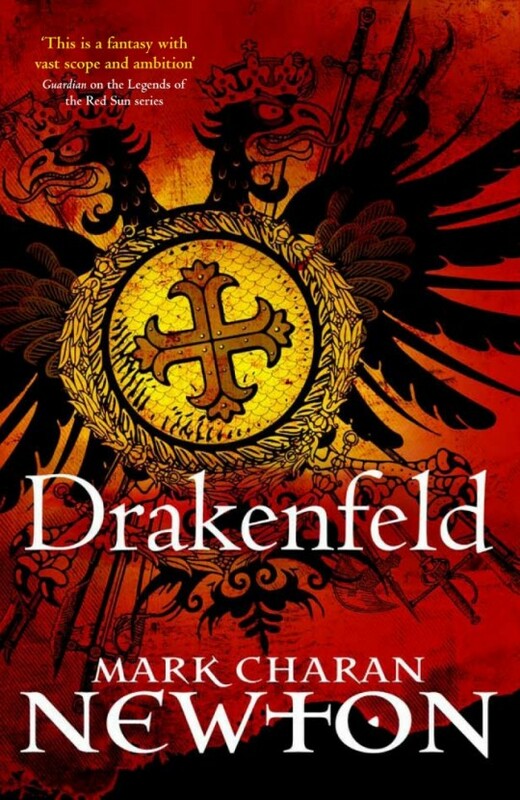 Drakenfeld is an interesting blend of Historical Fantasy and Crime Fiction, set in a beautifully imagined world that seems to have been inspired by Ancient Rome. That inspiration is clear to me in the description of the cities and their architecture as well as the traditions (particularly that of the worship of the dead and their mausoleums) and the presence of a Senate for example. But this is mere foundation as the author builds something new upon the inspiration. The crime itself is a locked room mystery and the progression of said mystery relies on familiar slow-paced investigative work that leads the protagonist down rabbit roles. In doing so, the author gradually and to great effect reveals the nooks and cranes of the world-building and the depths of its main character. This is where the greatest strength of the novel lies: in the examination of the world the author created through the eyes of Drakenfeld. Drakenfeld is a novel that became more and more interesting as the depths of its groundwork became clear. Tyrum is a city that for all of its glory and pride of its advancement and achievements, it is also one where the rich and privileged live a good life as opposed to that of lower class of its citizens. It is one where politics and social spectacles are bloody, corrupt affairs and where women have different social standings to that of men – true to all social scales but more strict depending on your class. The discourse of its more upstanding class of citizens is one where there is no better place than Tyrum – which is something that is obviously not true the more we come to learn about it. And dismantling Tyrum, figuratively and literally, is one of the novel’s main thrust. The main (and only) viewpoint is that of Drakenfeld, someone who is extremely privileged, from a good family, with enough money, from a higher class of citizen and whose job offers him honour and acolytes. He definitely has an understanding of his privilege and how it sets him apart – another side of said privilege is his freedom to come and go. And by travelling all around the empire he has seen what other cities and civilisations have done and how other nations treat women with more equality for example. This is definitely something he has fully absorbed in different ways and it impacts his personal relationships to women and how he approaches the investigation into Lacanta’s death. One of my favourite things about the novel is actually the friendship between Lucan and his assistant/bodyguard Leana – a warrior woman from another culture, whose foreign presence upsets the citizens of Tyrum (another way in which this nation reveals another dark side: racism). Over and over Lucan speaks of how much he relies on Leana to keep him alive and how he sees her as a sister. Lucan Drakenfeld is someone who, at heart, abhors violence. He is cerebral. He’s polite. He doesn’t have a fascination with heaving bosoms. He’s nowhere near as tough as his female bodyguard. But most importantly, he will always think before hitting someone with a sword. That’s not to say that he doesn’t hit anyone with a sword at all, but I wanted a character for whom violence always had to be significantly justified. Because killing someone in real life means that a daughter could go without a mother, son could go without a father, that a family’s income could be cut off (hey, not many worlds have social security nets). A child might well go down a dark path. To me, good writing would understand that sentiment, and a well-written character would have to understand what that meant within the novel. Drakenfeld is a man who is involved with violence on a daily basis as part of his job but abhors it and questions the ethical implications of his every move. He’d personally rather not have his hands dirtied with the blood of others even if he relies on Leana to take care of some of this part of business. Part of his motives comes from his personal demons, part from choosing to worship and love a Goddess called Polla who is the Goddess of good advice, of reason, of investigation and inquiry with scriptures that are “practical instead of judgmental”. But the thing is: his choices? Are choices that also come from privilege – they are choices that he can do because he has never really suffered it directly. So, it is easy for him to make them. One great moment in the book is how he questions Leana for how she easily she seems to fight and kill: she directly calls him on that because she didn’t have that choice when her entire village and everyone she ever knew were destroyed in a violent attack. I’d love to see more from Leana – a bigger presence in the next book. I appreciate the direction that the character takes very much, especially when confronted by not only violence and murder but by opposing opinions. But there are some pitfalls to this choice of protagonist, of course. At times, it felt like Drakenfeld was less active than anybody else in the novel and his investigative method sometimes felt too directionless for a competent officer of the law which makes the mystery side of the novel less convincing. My biggest problem with the novel though is the romantic relationship between Drakenfeld and an old lover, Titiana. Before leaving Tyrum years before they had a forbidden relationship that ended with Drakenfeld leaving unscathed – apart from a broken heart – whilst Titiana stayed behind to deal with the terrible consequences of their affair. When he comes back they resume their relationship. Since the book is from Drakenfeld’s perspective, it is his viewpoint that colours the narrative and when it comes to Titiana, he is naïve, earnest and trusting. Although I liked how this was clearly made obvious in the narrative that it was his perception of her that was wrong, I feel strongly that this story in particular needed Titiana’s own voice to be told. Everything we learn from her is from unreliable perspectives and given how her story ended, there will be no direct confrontation about those expectations, and it seems like she was there simply in relation to Drakenfeld and not as a character on her own. This to me is the biggest misstep in an otherwise great book. That said, this is still Fantasy and within the context of this world there is scope for Titiana to “return”. Yes, Mr. Newton? I will be back for more. Murder most foul has consequences, and it will be interesting how this one (re)shapes Drakenfeld’s world. ‘For some time we walked through the throng – a good few hundred, all in all, each in their most opulent clothing. Platters of food were discarded on side tables, having been pillaged long ago. A low-level muttering had replaced lively chatter; more than once we stepped through deep silences as conversations suddenly paused at our approach. Along the walls, bright banners of Detrata, each one bearing either the image of the double-headed falcon or the cross of the founding gods, hung down from an impressive height. I sure home that Mark continues to explore this world.